Democratic Rebirth in Nigeria Vol. 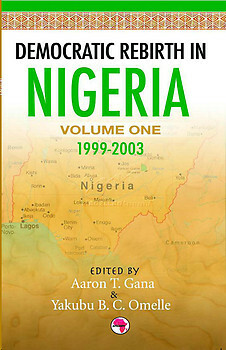 1: 1999-2003 (328pp ISBN: 978-166-363-4 6 X 9) was a book and cover design project undertaken by AMV in 2005 for the African Centre for Democratic Governance (AFRIGOV), a research and advocacy NGO based in Abuja, Nigeria co-edited by the late Prof. Aaron T. Gana and Y.B.C. Omelle. In this collection of evaluative essays from some of Nigeria's most engaging scholars the reader is given a peep into the contradictions of Africa's political juggernaut. Over fifteen years of the most brutal military dictatorship left Nigeria and Nigerians physically brutalized, psychologically traumatized and spiritually and morally denuded. Yet in these essays the reader will find consolation in the vibrancy of a people materially defrauded but determined to reverse their fortunes; emotionally drained but unyielding in their struggle for political emancipation, and ethically emasculated but hanging on to the prospects of a transformatory moral rebirth. That is the promise of a country whose decadent elite persistently call the Giant of Africa but which they have bled prostrate. Yet as the essays highlight, its people people remain undaunted in their resolve to democratize, not only governance but even more importantly, the prosperity God had buried under their soil which the kleptocrats want to exhume and privatize. Those who are interested in understanding the tragedy of a nation so much endowed but crippled by a bankrupt and visionless leadership must read this collection. Aaron T. Gana was, until recently the Executive Director of African Centre for Democratic Governance, a research and advocacy organization based in Abuja, Nigeria. He has taught at Ahmadu Bello University, the City University of New York, the University of Oklahoma, and the University of Jos, where he was the Chair of the Political Science Department and Dean of the Faculty of Social Sciences before retiring in 1996. He is currently the Vice-Chancellor of Bingham University, Karu, Nassarawa State, Nigeria. Yakubu B. C. Omelle who studied at the Ahmadu Bello University (ABU) Zaria, and the University of Calabar (UCC) holds a PhD in Political Science with specialization in Political Economy. He has lectured at various tertiary institutions and universities across Nigeria including the University of Calabar, the Nigerian Defence Academy (NDA), the University of Abuja and University of Uyo, where he served as Special Assistant to the Vice Chancellor and Associate Professor of Political Science. Dr. Omelle’s wide-ranging areas of research interest include the dynamics and structures of domestic politics, international Politics and diplomacy, politics of African regional leadership, and the political economy of globalization. He is a diligent and versatile scholar with several publications to his credit.